One day early in the twentieth century, Francis French decided that America needed a better mustard. "I want a new kind of pure, prepared mustard," he told his elder brother George, then President of the R.T. French Company. "There is no condiment like I have in mind on the market, and I'm sure that such a mustard, even if it costs $10 a gallon, would have a ready and wide sale." This was 1904. Teddy Roosevelt had just started working on the Panama Canal. Radio and film were still brand new forms of entertainment. The few automobile owners out there were limited to twenty miles per hour. In fact, the ice cream cone had hardly even been invented yet! If Americans wanted mustard, they had to make it themselves. Needless to say, Francis and George were on to something. Since 1880, their father's brand represented excellence in the spice market. Now the founder's sons were starting fresh and reinventing mustard. As the story goes, French's Cream Salad Mustard debuted at the St. Louis World's Fair, where more than twenty million people—about a quarter of the population at the time—discovered French's natural flavor. And when paired with the hot dog—another American classic that came out of the World's Fair—French's mustard became an instant success! When French's Cream Salad Brand was first introduced at a price of ten cents, each 9 ounce jar came in its own carton with a wooden paddle for serving. Prior to 1921, there was no national advertising and 1921 sales totaled less than $2.5 million. During this early period, French's Cream Salad Brand literally sold itself as sales grew exclusively through word of mouth. By 1926, after a national advertising campaign had been introduced, sales jumped to $5.3 million. Great weeknight dinner. We like a lot of glaze on the ham. You can brush on as much glaze as you like. Place ham steak on rack of broiler pan. Brush with honey mustard mix. Broil for 4 minutes, turn ham steak, brush with remaining honey mustard mix, cook another 4 minutes, until heated through. Enjoy! Combine all ingredients. Cover and chill for 2 or 3 hours. Honey mustard by far is the best when it comes to topping ham! 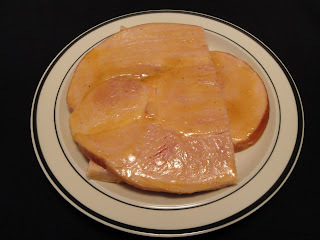 I need to start preparing ham steaks this way-delicious. What a delicious ham steak love the sweetness. Thank you so much! Looking forward to sharing. I love honey mustard and never once considered making it. Thanks for the recipe. No need to say sorry. Thank you! Interesting history of mustard! I'm not a big fan of just mustard, but I love a good honey mustard dressing or glaze, like this one! Perfect for ham!